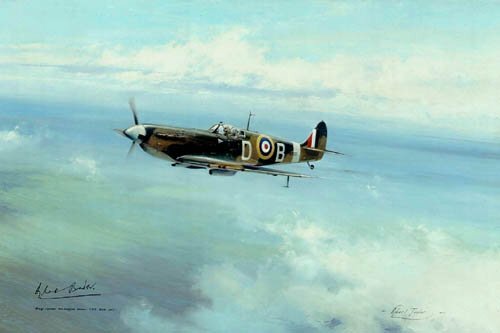 The legendary Wing Leader Douglas Bader high above the south coast of England, flying his beloved Mark Va Spitfire. Bader's inspired leadership spawned some of World War II's greatest fighter leaders- Johnnie Johnson, Denis Crowley-Milling, 'Cocky' Dundas and many others. Overall print size: 27" x 20"
have signed this tribute to the Legendary Wing Leader.